Wonderland by Tommy Kovac, illustrated by Sonny Liew. A new angle on Alice in Wonderland told from the point of view of Mary Ann, the White Rabbit’s housemaid. Collected edition of separately released comic books. I really like this. One of the few of my ever growing collection that I’ve actually read. It’s fun, and funny and Liew’s illustrations are really distinctive: echoing the Disney designs but playing with them- sketchy and stretchy and, well, animated. Tommy Kovac has a cool library type blog thing. Among the numerous curiosities that have gone unexplained in the classic tale Alice in Wonderland, perhaps the most perplexing might be who, exactly, is the “Maryann” that the White Rabbit mistakes Alice for at the beginning of the story? Lewis Carroll first made us ponder this and, years later, Walt Disney again made viewers wonder who Maryann might be in his classic feature length film based on Carroll’s book. Now, the amazingly talented folks at SLG Publishing, through a licensing deal with Disney, have finally answered this age-old question. In their beautifully executed comic book series, WONDERLAND, readers experience Alice’s fantastic world as they’ve never seen it before. Writer Tommy Kovac’s Wonderland is missing Alice herself, but it’s still populated by the other characters that make the world such a curiously exciting place. The Queen of Hearts is present, barking orders to lop off people’s heads, as is the Cheshire Cat, the White Rabbit, the Mad Hatter and the rest of Wonderland’s beloved cast. And there are some new faces, too, including the book’s main protagonist, the mysterious Maryann herself. All are beautifully illustrated by Wonderland’s artist, Sonny Liew. The graphic novel will collect the six issues that comprised the Wonderland comic series in a beautiful, collectible, jacketed hardcover. Bits and bobs from my fantastic Hen-do at the Oxo Tower. Thanks to Siobhan, Fran and Ant! We’re super excited. And you should be too. We’ve a rather marvellous new Not Afternoon Tea experience to celebrate the 150th anniversary of Alice in Wonderland. Continue your adventure through Wonderland with the delicious Golden Afternoon cocktail and a box of Alice-themed treats to take home. I Am The Forager combines the best of the season on one plate with crab apples, acorns and wild yellow plums bringing both sweet and creamy notes to some classic desserts. Fun Fair is a sugary homage to nights spent riding the waltzers and spinning tea cups with warming popcorn pannacotta, marshmallow and candyfloss, and cinnamon dusted apple and custard doughnuts. If you’re never one to turn down something ‘chocolatey’ then Nuts About Chocolate with its milk chocolate and hazelnut tart (think posh nutella) and white chocolate pistachio cone will certainly give you the fix you’re after. Especially when washed down with Frappé, a milkshake that’s strictly for adults. Alice’s Adventures in Wonderland illustrated by Fran Parreno. Padded hardback cover with ribbon marker. Fran Perreno is the illustrator of several children’s books . The pictures themselves are charming, but don’t really show us much we’ve not had before. The publisher’s site includes readings of Jabberwocky, Father William and The Walrus and the Carpenter, and a glossary of Jabberwocky words. Booklet of puzzles and quizzes given out at RHS Wisley to support their 2015 Adventures in Wonderland event. You’ll be grinning like a Cheshire cat as we celebrate the 150th birthday of Alice’s Adventures in Wonderland, sponsored by Witan Investment Trust, with free activities every weekday and live music on Sundays. 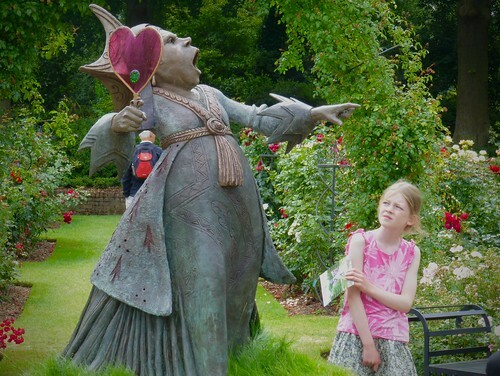 Join Alice and her friends for creative activities such as arts & crafts, music, cooking, theatre, puppet shows and more.Take on the adventure and follow the clues on our garden trail. Run around on a caucus race, or try your hand at a game of flamingo croquet.